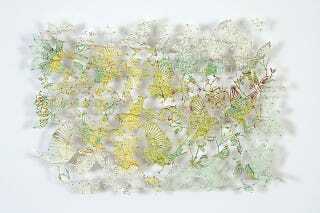 This is a piece by Claire Brewster who makes art pieces of birds, bees, and flowers from maps. Some of her work is hand cut and others are laser-cut. All are gorgeous. I use old and out-of-date maps and atlases as my fabric to create intricate, delicate and detailed sculptures and collages that have been described as 'exquisitely ethereal' by the Financial Times.. Nature is ever present, even in the most urban environments, taking over wherever we neglect, living in a separate yet parallel universe. I take my inspiration from the natural environment, creating entomological installations of flora and fauna from imagined locations. My birds, insects and flowers transcend borders and pass freely between countries with scant regard for rules of immigration or the effects of biodiversity. The sculptures are either pinned directly onto the wall as a large scale installation or captured in box frames. The shadows created when light is shined on them creates a dynamic three-dimensional quality and creates a feeling of movement. Below, a close-up of her work and another piece called "North American Physical Features."